New research has shown that the bacteria in our gut can be a cause of obesity. The human gut is filled with health-giving bacteria, which provide energy, nutrients and digestive aids. Research has now demonstrated that the amount and type of bacteria in your digestive tract can reduce obesity, and not just improve digestion. A study at Washington University School of Medicine investigated the digestive tract of fat and thin people. The three dominant family groups in the human gut are Fimicutes, Bacteriodetes and Actinobacteria. Previous research has shown that a proper ratio between the Fimicutes and the Bacteriodetes is necessary in order to maintain good health. As we age, this ratio changes and might be one of the causes of adult onset obesity. New research discovered that obese people had higher amounts of Firmicutes. Lean people had higher amounts of Bacteriodetes. When obese people were put on fat reducing diets, the ratio of bacteria in their gut changed, corresponding to the same ratio of bacteria in the guts of the lean people; that is, the amount of Bacteriodetes increased as the obese subjects lost weight. Aids to restore proper digestive flora can include adding probiotics to the diet such as yogurt pickles, sauerkraut, miso, and chutney. Probiotics are known to also increase immunity and help prevent colds and flu so it is important to take probiotics daily, especially during flu season. Did they monitor the physical activity levels of either group? They discuss how research is showing that colds and flu could be caused by a lack of good bacteria in your stomach. Fortunately, there are supplements you can take to increase the amount of good bacteria and improve your health. It’s strange to think that you can treat and even prevent illness with bacteria. When the number of good bacteria starts to decrease due to antibiotics or a poor diet your chances for illness are increased. Probiotic supplements have been shown to have many health benefits including aiding in digestion and keeping you regular. Probiotics are not “one size fits all”. There are many different strains of probiotics each having its own specialty. No mention of any studies, number of subjects, streams of colds or flu’s. This entry was posted in Uncategorized on March 15, 2010 by kyleguay. We’ve learned that when the survival of a bacteria is threatened it can retreat in effect to a dormant stage, which will allow it to become active once more in the future, and protect it from whatever external conditions are capable of destroying it. There is an additional form that some bacteria can take, they are called “persisters”. These persisters are essentially dormant cells, but the key difference that the literature I’ve looked at discusses is that these cells are highly tolerant of antibiotics, to the point where some antibiotics used to target bacterial DNA may actually induce bacteria to enter this persister state. Because of their ability to seemingly return from the dead, persisters have been likened to zombies by several investigators working in the field. Persisters had been present in scientific discourse since 1944, however there hadn’t been much research devoted to them until recently. Even in the early 2000s, persisters were referred to as hypothetical constructs whose existence hasn’t been effectively tested. Recently there has been increased interest in persisters, precisely because not much is known about them, but the medical ramifications of their existence could be very important in patient care. An article in the Boston Globe outlines the research of Dr. Kim Lewis, at Northeastern University. Dr. Lewis has been working on isolating one of the ways E.Coli is provoked into entering a persister state. While very few cells may actually become persisters, an amount as small as 1% in a bacterial film, they could bring back previously had diseases by re-growing the population. Dr. Lewis and colleagues administered ciproflaxin, which is an antibiotic that targets and damages the DNA of bacteria, to E.Coli, and found that some cells have a repair response which resulted in the bacteria forming certain proteins, one of which when present in large numbers, results in presisters. The potential for the application of knowledge surrounding persisters could be fundamental to improving patient care, particularly looking at the rate of infections in hospitals. Reinfection could be understood more clearly, as well as the general knowledge of bacterial survival. Dr. Lewis received funding from a source that particularly funds what the article calls “innovative and risky research projects,” so one reason for the lack of research in this area despite the possibility of enormous benefit could be a lack of financial will. Traditionally governments haven’t been too vocal about supporting basic research, and when encountering a virtually unknown area of study, basic research is what is necessary. As researchers such as Dr. Lewis make gains studying persisters however, it is likely that additional research will appear, and hopefully more than one method of creating persisters will be identified. This entry was posted in Uncategorized on March 15, 2010 by spudar. The point of the experiment was essentially to measure the influence of microgravity on yeast resistance to an anti-fungal agent. Previous experiments had indicated that some organisms become hardier and more virulent in outer space and more resistant to drugs. Weightlessness might be changing how the drug reacts within the cells, or it might be switching on and off certain genes, resulting in greater resistance. Such effects will become more of a concern to astronauts on longer-duration space flights like a mission to Mars. – Overall I think the research they are conducting could be very useful. As such a huge part of our life is microbes, if we are going to travel in space we should be learning the effects of zero-gravity conditions not only on ourselves but the microbes around us. – If microbes do in fact become more resistant to anti-bacterial agents while in space, that is very important to know, as I think we will inevitably have to attempt long-duration space flights at some point. Learning how microbes react to zero-gravity conditions could help us better prepare for these long trips. – I also think we need to be cautious of all the bacteria we are taking with us when we do travel to space and potentially to other planets. – Lastly although the cost of this experiment was said to be cheap, the project still cost 3 million dollars. Perhaps that money could have been used towards a better cause than learning about the effects of zero-gravity on one specific microbe. This entry was posted in Uncategorized on March 14, 2010 by mikercm. A study at the University of Ottawa says that hand sanitizers claiming to kill 99.9% of germs actually kill much fewer in real-world conditions. Although the statement of 99.9% effectiveness may be true in lab settings, in ordinary life using soap and water is a much better alternative.The microbiologist in charge of the study, Jason Tetro, recommends using hand-sanitizing gels only as a supplement in situations where soap and water aren’t available. The study was conducted using school children from Hamilton, Ontario. First, a sample of germs was taken from each child’s hand and swabbed with sanitizer to see which portion of bacteria remained. The scientists only looked at bacteria picked up from surroundings such as E.coli, campylobacter and salmonella and not healthy bacteria normally found on the skin. Three different hand sanitizers were tested: President’s Choice, Purrell and Soapopular. Purrell killed and average of 60.4% of bacteria on the hands, while President’s Choice killed 54.6% and Soapopular killed 46%. All three had lower elimination rates than the 99.9% efficiency advertised. The study also looked at the effectiveness of the sanitizers against clean or dirty hands. It was found that the hand sanitizers were most effective on already clean hands, and were least effective on hands that were already dirty. This was due to the dirt on the skin preventing the alcohol from killing all of the bacteria and viruses present. The hand sanitizer only aims to kill the bacteria and doesn’t eliminate dirt and residue on the hands. On the contrary, using soap and water removes dirt and kills and removes germs, making it a much better alternative. The scientists say that the advertising on the hand sanitizing packages are misinforming as they state that the sanitizers are a great alternative for washing your hands while in reality they are only beneficial if you wash your hands with soap and use the sanitizer. -I think that this article in informative because it is important to know how to properly clean your hands, especially in flu seasons, as someone might use hand sanitizer with the false impression it is 99.9% effective and not wash their hands. -We also have tons of hand sanitizing machines all over campus, which may lead students to wash their hands less because they feel as if using the hand sanitizer is a quicker and more convenient alternative. -My thoughts kind of vary on the issue because 60% effectiveness is still killing bacteria that would still be present on your hands if sanitizer weren’t used. But if continually using sanitizers that don’t kill all bacteria leads to resistance and super-bugs, I don’t know if the risk of using them is worth it. -My only other thought is that the conductors of the study only tested the sanitizer on the hands and not soap. I think the argument would be more compelling if they also swabbed the children’s hands with soap and compared the effectiveness percentage against those that were found for the sanitizers. This entry was posted in Uncategorized on March 10, 2010 by melissa church. However, I don’t think that this was the primary concern for the developers. It seems rather that they have mapped a deficit in the market of food production that they can exploit for their own advantages or as they phrase it: “… growth won’t be a problem [for the company]”. Even though this seems a normal and legitimate thing to do, I would rather see the government take steps to implement such research. Moreover, the industry is for rather obvious reasons very interested too in such a product’s rapid approval by the government. As Dr. Huffman from Maple Leaf Corp. says “[the company] is pushing for government approval of these more rapid testing methods.” Again, I think corporations are interested rather due to the faster and less expensive method rather than their concern for public health. This entry was posted in Uncategorized on March 8, 2010 by Gaudenz. This is where I initially found information and got interested about my subject. What Asknature.org is, is an open source project that gathers ideas, and inventions that try to incorporate or emulate natures functional design and strategies into their own synthetic models. The website assumes that nature, through the process of evolution and natural selection is our greatest problem solver. Mimicking what nature does to overcome its own obstacles will provide us with sustainable strategies to survive the seemingly “unnatural” we are creating. Bellow is the link to the article about sharkskin repeling bacterial breakouts found at asknature.org. I would encourage you to browse the site, or add to it if you have any inventions or ideas about biomimicry of your own. This is another site where I found another article about the Sharkskin like material that impedes bacterial breakouts. Sharklet technologies holds the patent for this material and has not brought it to market yet. It is continually being tested and is under the “intense” scrutiny of the FDA. The Link to the article found at popsci.com is found below. One criticism I had for these two articles is that they really don’t go into depth about the significance of the invention or how and why it works. They briefly suggest that shark skin repel bacterial break outs by discouraging the formation of biofilms. Both articles then neglected to entail what a biofilm actually is. Biofilms are a structured community of cells that are enclosed in a self produced exopolysaccharide matrix or EPS and are associated with a surface. Many different bacteria form biofilms. E.coli is a commonly known bacteria that can form biofilms. Interestingly, biofilms are formed through a phenotypic shift in the behavior of a bacterial cell which permits it from living on its own to living in a community matrix. Biofilm formation is dangerous because they increase the chronicity of infectious diseases. Biofilms are also highly resistant to antimicrobecites such as antibiotics. Essentially what Sharklet AF does is stop the formation of biofilms. Sharklet technologies uses microtopography to map out and design the material to resemble the surface of the sharks skin. Microbes are able to attach to this material but are unable to attach to each other and form a biofilm. The single bacterium cell will either not survive on its own or be unable to significantly infect a host body. This material is an adhesive that can be applied to different medical operating tools, on faucets, door handles and many other medical instruments. This material can also be thought to reduce the use of or need of antibiotics. My other criticism is that no where in the article’s does it say what the ecological footprint of manufacturing this material might be. Below is also another article about Sharklet AF. A far more in depth read!! This entry was posted in Uncategorized on March 4, 2010 by Ian Simpson. 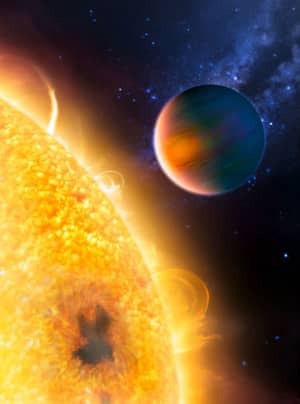 Glowing methane has been detected in the upper atmosphere of a Jupiter-sized planet orbiting very closely to its star. The planet, called HD 189733b, is orbiting a star about 63 light-years away in the constellation Vulpecula, the fox. Astronomers used the three-metre NASA Infrared Telescope at the top of Mauna Kea in Hawaii to detect the methane as it glowed under the radiation of its sun. HD 189733b completes an orbit once every 2.2 days at a distance of 4.6 million kilometres from its star, or just one-tenth of the closest distance between Mercury and the sun. The fluorescence of methane has also been observed in the atmospheres of Jupiter, Saturn and Titan, one of Saturn’s moons. The process is similar to the one that causes gases in the Earth’s atmosphere to glow during the northern lights. Astronomers using space telescopes have previously discovered methane in the atmospheres of planets outside our solar system, or exoplanets. Methane is considered part of the basic chemistry of life because it contains a carbon atom. This research, led by Mark Swain of NASA’s Jet Propulsion Laboratory and published this week in the journal Nature, used data from the Hawaii telescope, and the Hubble and Spitzer space telescopes to get a complete picture of what’s happening on the distant gas giant planet. Certain parts of the infrared spectrum aren’t accessible to the space telescopes, but in that spectral region “ground-based observations provide a unique capability,” the astronomers wrote in Nature. “We believe the calibration method used here can be applied directly to many existing instruments,” the researchers wrote. The researchers said the technique could be used in other ground-based telescopes, meaning future discoveries in exoplanet astronomy wouldn’t all be coming from space telescopes. On earth, sources of methane are anaerobic bacteria and methanogens that are found in wetlands, ocean sediments and the digestive tracts of some organisms such as the rumen of a cow and termites. These sources are important contributors to the carbon cycle which as stated by the article and what we learned in class is one of the most important cycles for life on earth. These discoveries being made about the components of other planets’ atmospheres are important for finding out more about what is occurring on other planets’ surfaces. These discoveries can help us in making the transition away from simply speculating and towards real evidence of there being biological life beyond earth. This quest to search for life beyond earth can help us to understand more about how we on earth evolved and how events occurred, allowing us to make more predictions about future events and develop strategies towards keeping our earth alive and fully functioning. The atmospheric properties of distant worlds are becoming increasingly clear. The latest observations reveal fluorescent emission from methane in the upper atmosphere of a Jupiter-like extrasolar planet. The first extrasolar planet found to be orbiting a Sun-like star was detected less than 15 years ago. As astronomers detect more and more planets orbiting stars other than the Sun in our Galactic neighbourhood, increasing attention is being paid to probing their atmospheres, and for good reason. Planetary atmospheres can be easily altered by geophysical1, photochemical2 and biological3 processes. Owing to the relatively small amount of mass in an atmosphere, its properties can bear the signatures of processes driven from the planetary interior or surface that would not otherwise be observable. A notable example is the presence of the powerful greenhouse gas methane (CH4) in planetary atmospheres. In Earth’s atmosphere, the dominant sources of non-anthropogenic methane are anaerobic bacteria and methanogens, which inhabit wetland and oceanic sediments, and the digestive tracts of some organisms (for example, ruminants and termites). Methanogens, like most archaeal microorganisms, can thrive in a wide range of conditions, including many that would be harmful to the bulk of complex life forms on Earth. Jupiter’s methane, meanwhile, is photochemical in origin, and so is dependent on the radiation field incident on the atmosphere and the specific abundances of carbon, oxygen and hydrogen4. Fluorescence occurs when an atom or molecule absorbs a photon, is excited into a higher energy state and subsequently de-excites, emitting light at lower energies. It requires the relatively low particle densities that occur high in planetary atmospheres, where the time between collisions is longer than the time required for radiative relaxation. Methane, like all molecules, can only make such transitions among specific permitted electronic, rotational and vibrational energy pathways that are unique to its molecular structure. The result is a characteristic spectrum of emission lines, and it is one of these emission lines, distinctive to methane, that has been detected by Swain and colleagues5.Fluorescent emission is relatively common in astrophysical environments. It has been detected, for example, in the accretion disks surrounding supermassive black holes7, in the interstellar medium8 and in comets9. Specifically, the fluorescent methane emission detected by Swain et al.5 on HD 189733b has also been observed in the atmospheres of Jupiter, Saturn and Titan10. Fluorescence of other organic compounds has been detected on Venus and Mars11. These detections provide a probe of the physical structure of the upper atmosphere of these planets from the perspective of a minor atmospheric constituent. Methane is particularly important because it may help us to find and evaluate possible biological influences on extrasolar planetary atmospheres. The upper atmosphere is a fascinating and important region where minor molecular constituents, such as methane, can play an indispensable part in establishing the overall heat budget of a planet, thereby altering the thermal profile of a considerable portion of the atmosphere. Powerful winds and vertical mixing of high-altitude atmospheric layers present the possibility for temporal and spatial variability of the fluorescent emission from such molecules. In addition, ionized particles in the upper atmosphere are affected by any global magnetic field — as is dramatically exemplified on Earth by another form of emission-line radiation, the aurorae. Because HD 189733b is extremely close to its host star (less than one-tenth the distance between Mercury and the Sun), energetic particles from its star will interact with any magnetic field the planet may have, possibly resulting in stronger emission-line displays than we see on Earth or Jupiter. Many other observed extrasolar planets are similarly close to their host stars, so variability in emission components because of magnetic effects may be common in these systems. Swain and colleagues’ detection5 of a fluorescent emission line of methane on HD 189733b paves the way for future observations of alternative fluorescent emission lines of methane and other molecules in extrasolar planetary atmospheres. These observations will require sensitive, high-spectral-resolution instruments that can resolve the emission-line profile of fluorescent signals. In addition, this discovery highlights a crucial theme in modern astronomy: the necessity of making complementary observations from the ground and from space. Depending on the wavelengths of the relevant spectral features, Earth’s own atmosphere may or may not interfere with detection. The authors’ observations5 were made with the 3.0-metre NASA Infrared Telescope Facility located at the summit of Mauna Kea in Hawaii. Our increasing understanding of this one extrasolar planet — from its discovery6 to the growing list of known constituents of its atmosphere, which includes sodium12, carbon monoxide13, carbon dioxide13, water vapour13 and methane14 — has been possible only with observations from both the ground and space. During the past few years, we have made a transition that deserves some rumination. Rather than speculating about the possibility of other worlds in the cosmos, we can now identify them specifically and enumerate their various characteristics. Many stars that are readily visible to the naked eye, at least from relatively dark sites that are not heavily polluted by artificial light, have planets orbiting them, the masses and orbital characteristics of which we know. A number of other worlds, soon to be discovered, will be small and rocky like Earth, and will have atmospheres that we can detect, inventory and monitor. It is quite possible that, within our lifetimes, atmospheric studies of these extrasolar planets will provide the first evidence of biological life beyond Earth. Swain and colleagues’ detection of the fluorescence of a hydrocarbon in the upper atmosphere of an extrasolar planet not only provides insight into the structure of the atmospheres of other worlds, but is also an important step in the far-reaching journey to uncover what may be below them. This entry was posted in Uncategorized on February 21, 2010 by laurenns. A type of bacteria that infects many insects may make mosquitoes more resistant to viruses that can be dangerous to humans, researchers have found. The discovery could be helpful in the battles against two painful and sometimes fatal diseases, dengue and chikungunya. Last year, researchers showed they could take Wolbachia bacteria from fruit flies and infect mosquitoes with it, cutting their already brief life spans by half. That discovery was important because most of the malaria transmitted by female mosquitoes is transmitted late in their lives. They must pick up the parasites by biting an infected human, and it takes days for them to mature and migrate to the salivary glands to infect the next human bitten. The bacteria appear to strengthen the mosquito’s immune system, the authors said, and may also use up some fatty acids that the viruses need to reproduce. Infecting mosquitoes with bacteria is tedious; thousands of embryos must be injected with superfine needles. But the bacteria then pass on to succeeding generations, and can even prevent uninfected embryos from surviving. Therefore, it may be possible to infect a small flock of mosquitoes and release them to spread the bacteria to every mosquito in a region. More Articles in Health » A version of this article appeared in print on January 5, 2010, on page D6 of the New York edition. Here is another article I found on the same topic. There are minute differences between the two articles in terms of details. “This might be very powerful in reducing pathogen transmission by Aedes aegypti to humans, particularly for dengue and Chikungunya,” O’Neill said. “Together with the previously described life-shortening effects, the results suggest we might be able to have a major impact on disease.” That’s if it can be shown that the Wolbachia infection can invade natural mosquito populations, he added, a question his team is working on right now. There is no vaccine or cure for dengue fever, which is a painful and debilitating disease suffered by some 50 million people worldwide every year. Dengue haemorrhagic fever, the more severe form of the disease, kills more than 40,000 people annually. Chikungunya usually isn’t fatal, but can cause symptoms similar to dengue. Human epidemics of Chikungunya have been cited in Africa, Asia and more recently in Europe, according to the CDC. Wolbachia is already rampant in nature; the bacterium is estimated to infect up to 60 percent of all insect species. They are passed from mother insect to daughter or son through the insect egg and readily spread to high frequency in many species of mosquito. The species that are the major carriers of human disease don’t normally carry them, but that’s something O’Neill aims to change. The idea would be to seed the natural mosquito population with Wolbachia by releasing mosquitoes that had been purposefully infected in the laboratory. Wolbachia bacteria have a good ‘trick’ to help ensure their spread, O’Neill explained. They are responsible for a developmental defect that makes the would-be offspring of pairings between infected male mosquitoes and uninfected females inviable. Since the bacteria is passed from mothers to their offspring, that means that infected females can actually have a reproductive advantage over uninfected ones, encouraging Wolbachia’s spread from one generation to the next. O’Neill said his team is working on computational models to determine just how many infected mosquitoes would need to be released for the infection to take hold in the wild. The researchers don’t yet know exactly how Wolbachia protects the insects from human disease-causing viruses. They have some evidence to suggest that the bacterial symbiont primes the insects’ immune system. Wolbachia may also outcompete the virus by limiting resources such as fatty acids inside the mosquitoes. Even if the strategy works in a natural setting, there’s a chance the mosquitoes or the viruses could become resistant to Wolbachia’s influence over time. This entry was posted in Uncategorized on February 9, 2010 by ymontana. My thoughts about this article is that the sample size (45 showers, 4 in rural areas) was too small and that the researchers confused correlation with causation. It seems to me that the lack of mycobacterium in rural areas seems to disprove that dirty showerheads on their own can be responsible for the bacterium. Instead it was most likely that the bacteria came from the water source in the urban areas. Most likely I think the bacteria came from bird feces, which can carry the bacteria, in the water source. I know that New York and Chicago, two of the cities in states where testing took place, have large populations of pigeons and it wouldn’t surprise me if somehow if their feces somehow ended up in the water source of these showers. This entry was posted in Uncategorized on January 27, 2010 by solesa.